In these hot water temperature control articles we explain how to buy, install, adjust and inspect anti-scald equipment to prevent hot water burns. We explain what a mixing valve, tempering valve, or anti-scald valve is, where and why these valves are installed on hot water systems, and how they work. This article series answers most questions about Heating System Boiler Controls on central heating systems to aid in troubleshooting, inspection, diagnosis, and repairs. Contact us to suggest text changes and additions and, if you wish, to receive online listing and credit for that contribution. Photo: a Sparco anti-scald valve or tempering valve installed at a hydronic heating boiler. Other texts refer to these safety controls as mixing valves or compensating valves or temperature compensating valves. Anti-scald valves are used on heating and plumbing systems to avoid hot water burns at plumbing fixtures such as sinks, showers, and tubs. An anti-scald or mixing valve mixes cold water with the outgoing hot water either automatically or manually to make sure that a person using the plumbing fixture won't be scalded. We describe and illustrate various types of automatic and manual mixing valves, anti-scald valves, or compensating valves in this article. Watch out: definition of mixing valve, tempering valve, anti-scald valve: most likely because of a combination of product liability concerns and because of the manufacturer of a mixing valve cannot control what other plumbing installation or operating details are followed at individual buildings, both heating boiler manufacturers (Crown Boiler Co. discussed at TANKLESS COIL INSTALLATION PROCEDURE) and mixing valve manufacturers take care to refer to products like the Sparco control shown above and the Watts mixing valve shown later on this page as a mixing valve or tempering valve. ASSE standard 1016, 1069 or 1070 listed devices should be used at fixtures to prevent possible injury. That advice means that besides these mixing valves that are typically installed at the water heater or tankless coil, separate anti-scald protection devices are available for installation at the point of use: sink, shower, or tub etc. Those sorts of anti-scald devices are also discussed in this article. In my experience with plumbing and heating installers, home inspectors, and consumers, these terms: automatic compensation valve, mixing valve, tempering valve, anti-scald device, are thrown about in a blizzard of usages that treat the words as synonyms. In the course of inspecting several thousand buildings between 1976 and 2014 I have almost never found anti-scald devices at individual plumbing fixtures in private homes. The only water temperature control we typically find are mixing valves at the hot water source. Worse, sometimes there is no hot water scald protection at all. Use of water use efficiency improvement devices such as low-flow shower heads. When a low-flow-rate shower head is retrofitted to a home where no anti-scald valve or automatic compensation valve has been installed, even if the shower controls or tub controls have been manually adjusted to provide safe comfortable water temperature, the unexpected use of other appliances or plumbing fixtures in the building can cause the water temperature at the shower or tub to suddenly become scalding. Just flushing a toilet or starting a washing machine can cause a sudden drop in the cold water pressure or flow, leading to scalding burns. Watch out: it can be confusing listening to plumbers, home inspectors, and building supply sales staff who toss around terms like "mixing valve", "tempering valve", and "pressure-balancing valve" a bit loosely, all referring to ways to avoid scalding burns at plumbing fixtures, but not all working the same way. at TABLE OF SCALDING TEMPERATURES & TIMES we include a photo of a typical water heater label warning about scalding temperatures, implying that this option is one to consider. A point of supply pressure balancing valve or automatic mixing valve (compensating valve, or a manual mixing valve) can be installed at or near the water heater, or at the tankless coil or other hot water source so that scald protection is provided even if the water heater is set to a high temperature. This approach is discussed beginning at ANTI SCALD VALVE OPERATION, and further reviewed by Steven Bliss at ANTI SCALD VALVE PROTECTION, Best Practices. An temperature-sensing thermostatic mixing valve or anti-scald device can be installed at or near the water heating device so that even if the water heater is set to a high temperature the building occupants won't be scalded when hot water is run at a plumbing fixture. To obtain more total hot water using this approach see HOT WATER QUANTITY IMPROVEMENT via ANTI-SCALD VALVE and see details at HOT WATER IMPROVEMENT. This approach to both hot water safety and to making hot water last longer is also illustrated and explained at POINT of USE BUILT-IN FIXTURE ANTI-SCALD VALVES. When a heating boiler uses a tankless coil to produce domestic hot water, a third single-function control may be installed for that purpose. In our photo a Honeywell limit control switch is being used to monitor hot water temperature at the tankless coil which is in turn mounted on a steam boiler of an older home in Portland, Maine. You can see the black-handled mixing valve in the lower right of this photo. Cold water from the building is entering the tankless coil via the bottom pipe (green corrosion) and hot water, heated by the coil is leaving at the upper part of the tankless coil, where it turns downwards to enter the left side of the mixing valve. Additional cold water is permitted to enter the bottom of the mixing valve, and tempered (non-scalding) hot water then leaves at the right side of the mixing valve in this photo. 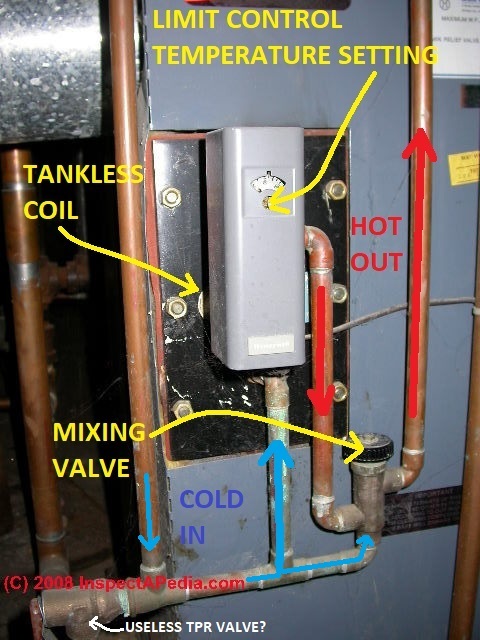 In this picture of a more traditional single-function heating boiler limit control, the limit switch is being used on a tankless coil, and in the enlarged version of the photo you'll see that the temperature limit on the control is set to about 140 °F. Below we show a sketch that explains how an anti-scald valve or tempering valve actually works. We have moved this scalding temperature table. See TABLE OF SCALDING TEMPERATURES & TIMES for a table of safe temperatures for residential hot water. Anti-scald valves used with water heaters are also called tempering valves or mixing valves. An anti-scald valve mixes cold water in with the outgoing hot water to assure that hot water reaching a building fixture is at a temperature low enough to be safe. In the sketch shown above, courtesy of Carson Dunlop Associates, an anti-scald valve (also referred to as a tempering valve , a compensating valve or an automatic mixing valve) is shown installed at the hot water piping and tankless coil on a heating boiler. The drawing illustrates that hot water leaving the tankless coil has been heated to 180 °F. by the coil which is itself immersed in hot boiler water. The 180 deg .F. water leaving the tankless coil is mixed with 55 °F. water inside the tempering valve. This produces outgoing hot water from the valve cooled down to 140 deg F.
In the U.S. most authorities consider hot water at or below 120 deg F to be safe from scalding. Some facilities limit water temperatures to 100 deg. F.
An automatic mixing valve or compensating valve such as those sold by Watts Regulator Co. or Sparco (and illustrated below) includes a temperature sensing mechanism that automatically adjusts the amount of cold mixed in with outgoing hot water to maintain the desired output water temperature. A manual mixing valve such as those often installed at older tankless coil hot water systems uses a simple gate valve that is manually adjusted by the homeowner. At a minimum the homeowner may have to adjust this valve seasonally depending on whether or not the building is also being heated by the same boiler as during the heating season the boiler will be kept hotter than during the rest of the year, making the outgoing hot water too hot. Which Way do We Turn the Anti-Scald or Automatic Mixing Valve to Make Hot Water Cooler or Hotter? How Can an Anti-Scald Valve Improve the Hot Water Volume & Quantity? Using an anti-scald valve or "mixing valve" or "tempering valve" on a hot water supply system can increase both the actual and the apparent total quantity of hot water available. That is, building occupants get a longer time in the shower, provided the hot water is used with some sense, as we explain here. We will have more "heat" stored in the hot water tank (or more heat stored inside the heating boiler that in turn is going to heat a tankless coil and thus heat water passing through the coil) if we can keep the hot water tank (or boiler) at a higher temperature. Watch out: when we heat the hot water tank or boiler to a higher temperature we also increase the chances of someone being scalded at the tap. Therefore, to avoid scalding, we mix cold in with the outgoing hot water (the right way to do this). Where a mixing valve is not installed (watch out for scalding!) we can be smarter at the plumbing fixture itself by turning on less hot water flow and more cold water flow so that the water is not scalding. 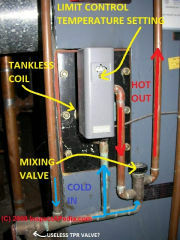 This combination of keeping water in the hot water tank (or boiler) hotter, but causing the volume of hot water to flow more slowly at the individual plumbing fixture, mixing in enough cold to get adequate flow quantity and safe temperature, is a risky (scald risk) alternative to using a mixing valve. We don't recommend this alternative, (see MIX VALVE SCALD PROTECTION, Best Practices) but we explain it here as you may encounter this approach, especially in an older building and one where there are no small children nor elderly occupants (who are at greater risk of being scalded). In either case, by starting with a hotter water heater or boiler and by mixing in cold in the outgoing water (or by regulating water pressures at the fixture), we consume hot water in the water heater tank more slowly. That means longer time in the shower. In sum, with careful installation of appropriate safety controls such as an automatic mixing valve or automatic tempering valve (or by careful use of a manual mixing valve), we can heat water in the water heater storage tank or tankless coil to a higher temperature, mixing or tempering it as it leaves the water heater or at the point of use in the building to avoid scalding. The result is more total hot water available from the same water heating equipment. Details about various ways to get more hot water or better hot water pressure and flow are at HOT WATER IMPROVEMENT where we provide a detailed guide to improving hot water quantity and flow when a tankless coil is installed as well as using other methods of hot water heating. Watch out: setting water heater temperature higher to attempt to obtain more total hot water at the plumbing fixtures without also installing and properly setting anti-scald devices can result in dangerous, even fatal hot water scalding burns. Watch out: read the installation instructions from the manufacturer of the product you are installing, both to make sure it's installed properly and thus will work as expected, and also so that you understand what to expect by way of hot water temperature control the product handles. WARNING: Thermostatic mixing valves are intended to increase the supply of hot water available from the coil. They are not intended to prevent a scald hazard. WARNING: FAILURE TO COMPLY WITH PROPER INSTALLATION AND MAINTENANCE INSTRUCTIONS COULD CONTRIBUTE TO THE VALVE FAILURE. This Hot Water Master Tempering Valves cannot be used for tempering water temperature at fixtures. Severe bodily injury (i.e., scalding or chilling) and/or death may result depending upon system water pressure changes and/or supply water temperature changes. These Hot Water Tempering Valves are designed to be installed at or near the boiler or water heater. They are not designed to compensate for system pressure fluctuations and should not be used where ASSE standard 1016, 1069 or 1070 devices are required. These valves should never be used to provide “anti-scald” or “anti-chill” service. I can see why you asked, Anon, as it's difficult to find repair parts for Danfoss TMVs in Nova Scotia. The first document below lists the components and parts of the mixing valve you describe - or a model close to it. The second provides instructions for a newer Thermostatic Mixing Valve or TMV from Danfoss, the Series 30 HR/HV. Danfoss does not sell directly to the public. To buy Danfoss equipment or repair parts, check with your local plumbing and heating supplier or with one of the online Danfoss TMV repair part kit suppliers we'll list below. TMV repair kit for Danfoss 1" valve. (Radwell is not an authorized Danfoss distributor). Continue reading at ANTI SCALD VALVE PROTECTION, Best Practices or select a topic from closely-related articles below, or see our complete INDEX to RELATED ARTICLES below. ANTI SCALD VALVES / MIXING VALVES at InspectApedia.com - online encyclopedia of building & environmental inspection, testing, diagnosis, repair, & problem prevention advice. Try the search box below or CONTACT US by email if you cannot find the answer you need at InspectApedia. Ed, sometimes hot water rises into the hot water piping above the water heater by natural convection - it depends on piping arrangements. There are special check valves sold to prevent that trouble. I'd replace the valve rather than take a chance on an improper repair that could scald someone. Question: how do hotels keep hot water safe and instantly available? Ken, sorry to read that you were burned. In my OPINION there is absolutely no proper plumbing hook-up that would ever send scalding or even hot water to supply a urinal. It sounds like a plumbing mistake and most likely improper installation. I suspect that the hot and cold water lines must be quite close or even touching right at the fixture. Install a tempering or mixing valve as discussed in these articles. Either at the shower or at the hot water source. Maureen, you may be better off removing the old device, sealing its mounting openings, and installing a modern, readily-available anti-scald valve. I've found that temperature swings can be a real hassle, even dangerous; the best protection is to install an anti-scald valve right at the device or shower, though it's a mess, meaning tear out and re-plumb what's there. IF you can get to the back of the shower wall from the other side (less of a hassle) you may be able to install a separate mixing valve there instead - cheaper, less demo. I'd suggest installing a mix valve right at the water heater as a whole-house solution - as until this month I thought that was the best solution. 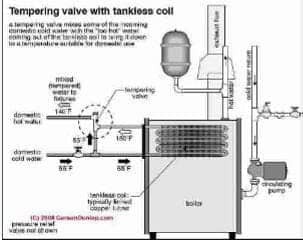 But working on an article (just finishing up today - see TANKLESS WATER HEATER INSTALLATION) on how to install a tankless water heater I found that building piping routing and layout can cause some odd temperature behavior depending on system water pressure and type of hot water heater in use. So those are the two choices. Question: calcuim build-up clogs anti scald valve? We have a townhouse with a tankless boiler which is supposed to provide up to 12 gpm hot water. There is a Honeywell thermostatic mixing valve installed right off this main hot water line, assumably doing its job of tempering the whole-house hot water. The issue is that even with one extra faucet or shower on, somebody using hot water will get lukewarm, or even pure cold, water. If none of these faucets or showerheads use more than 2.5 gpm, how come we can never use more than one warm or hot water outlet at a time? It is a real nuisance, and the tenant is complaining of cold showers. If hot water temperature drops that's not likely to be due to the mixing valve, more likely due to the water supply or supply piping. Question: override the mixing valve? Is it possible to install something to override a mixing valve from the apartment below? The landlord in the apartment below me has been using a mixing valve to prevent me from getting adequate hot water. I've been contacting the landlord and suing him and nothing has come of it. I'm not sure how we could have a plumbing fixture that is downstream from a mixing valve that could override it. That's because all water getting past the mixing valve will be tempered or adjusted to the temperature set by the valve. To make downstream water hotter again one would have to add a heat source. 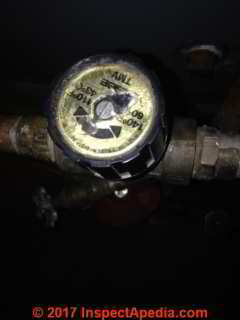 Anti-scald valve on hot water heater leaking when water is used. Leaks from cold side connection and from brass plug on bottom. Seems a simple fix but is a special thread sealer required for hot water? And, is fix as simple as it seems? A fix often sounds trivial but in the execution runs into snafu's. As long as you're careful that no pipe sealant is placed where it can enter the valve body, thread sealant or teflon tape should be ok. This valve requires periodic inspection and verification of the outlet temperature by a licensed contractor. Corrosive water conditions, hot inlet water temperature over 200°F (93°C), unauthorized adjustments or repairs could render the valve ineffective for its intended service. Regular cleaning and checking of thermostat assembly helps to maximize valve life and mixing function. Frequency of cleaning depends on local water conditions. Honeywell's Sparcomix tempering valve instructions include detailed procedures for disassembly and cleaning of the valve. And most of these valves have a replacable internal element. None of the instructions I reviewed addressed sealants. An automatic tempering or mixing valve monitors the outgoing water temperature and holds it with a narrow range around the desired temperature setting. A manual mixing valve such as your arrangement will permit water that is too hot or too cold depending on variations in the incoming cold and hot water temperatures. The best you can do with a manual-only mixing valve is to set it to use enough cold that the outgoing mixed water is *never* scalding. That means at times it'll be cooler than you'd like. Alex, I'd be glad to look into the question. Of course I'm inclined to defer to the onsite expert but I do have some questions. Is there any more model informationabou the EverHot? Also if you want to send me some sharp photos of the system and piping and valve arrangement that might invite comment as well. Use our CONTACT link. I'd like the same info on the mixing valve: brand, model, photos. How is this system being used: is this a commercial rather than residential application? At higher volumes? I see multiple sinks with a mixing valve only under one of them. How does this work? I have a whirlpool tub that I can't seem to get enough hot water to even cover the jets! Plenty of hot water everywhere else. Wondering if there is a scalding valve involved and where it would be located? We have a new hot water heater and plumber said I should be able to fill tub at least two times without running out of hot water!? I agree that there's a troubling problem, but it's not an anti-scald valve. Those valves mix cold in with hot to avoid scalding. They don't limit the volume of water that can enter a tub. I'd start by doing a simple measurement, very rough, of the tub's dimensions so as to calculate how many gallons you need to fill the tub. Sometimes whirlpool tub sizes can be misleading. I have a peerless tankless oil burner and getting no hot water. Put a new mixing valve on about 6 months ago and it's been fine till today so I took the insides out and ran it and still water is ice cold. It seems that it's not getting any hot water thru the valve as the pipe coming out of the boiler to the valve is super hot. Could it be a clogged flow regulator on the cold supply line or the coil? I agree that it sounds like a blockage; feel the pipes and you can find where the pipe changes from hot to cold - that's the obstruction. Usually. If the coil were totally blocked you'd get no water coming out of the coil ahead of the mixing valve. Question: redundant anti scasld valves or mixing valves? I live in a 35 unit building with a boiler that has a mixing valve. Yesterday the water was shut done for a plumbing repair and today the hot water is scalding and there was less cold water in the shower. Does the set temperature on the mixing valve change when the water is shut off? I am considering asking my plumber to install two, redundant mixing valves to prevent against scalding. I would prefer to provision my hot water source so I could set my hot water heater to relatively safe 120 F, but want to protect against bacteria. So, I will likely set the hot water heater temp to 140 F, and use a mixing valve. Since scalding can be a serious injury, it seems prudent to employ a redundant design. I wonder if you see any reason that a whole-house manual mixing valve, followed by a whole-house automatic mixing valve, or, two whole-house automatic mixing valves inline would be ill-advised? I am also planning to include a thermometer inline after each valve to monitor temperature and operating status of each valve. Thoughts welcome. I'm not sure I can give a definitive "right" answer, as there are different features or advantages of a whole house anti-scald versus point of use anti-scald. Anti-scald built into a point of use such as at bath and sink controls on some homes can deliver hotter water, in particular if there are long piping runs (and thus heat loss) between the water heating source and point of use. 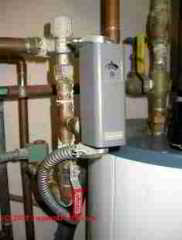 But safest and most economical is a single anti-scald valve or mixing valve at the water heater. I might want both a whole house anti-scald valve and a point of use anti-scald valve if at a particular bath or fixture I wanted a second, lower delivery temperature: for example at the tub where the babysitter washes the baby. DanJoe, Thanks for your comments. I want same temp at all fixtures, just looking for extra protection in case of failure of one whole house mixing valve. Seems easier to install second whole house rather than retrofit a bunch of fixtures. Seems from your comments that redundant whole house is not common, but should not cause a problem with pressure. Does that sound like a fair summary? Bill: redundant mixing valves are indeed not common. A lot has been written about scalding hazards, particularly for children and the elderly. In performing scholarly research I could not find any references to duplexing anti-scald valves. 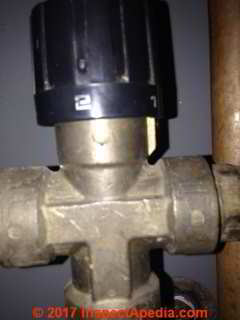 If a valve fails to mix cold in with outgoing hot you will notice that immediately. If you truly need the same temperature or precise temperature control at every fixture you'd need point of use anti-scald devices. That's because differences in supply piping length, location, routing, can make some differences in the temperature of heated water when it reaches the fixture. A single point of heating anti scald device sets the maximum temperature that may be supplied to fixtures. The actual temperature at individual fixtures will normally be a bit lower, lower still at the end of the longest runs. Insulating hot water piping reduces the en-route heat loss and can minimize these differences. DanJoe, Thanks again. I just want a precise max temp at the heater, my pipes are such that that will give me consistent enough temp at each fixture. Just considering redundancy for added protection, to avoid someone discovering it right away at a bad timw and resulting in a scald. Seems like a prudent measure that should be more common in my opinion, even with the extra expense. But I guess many people have no scald protection, so whose to say.